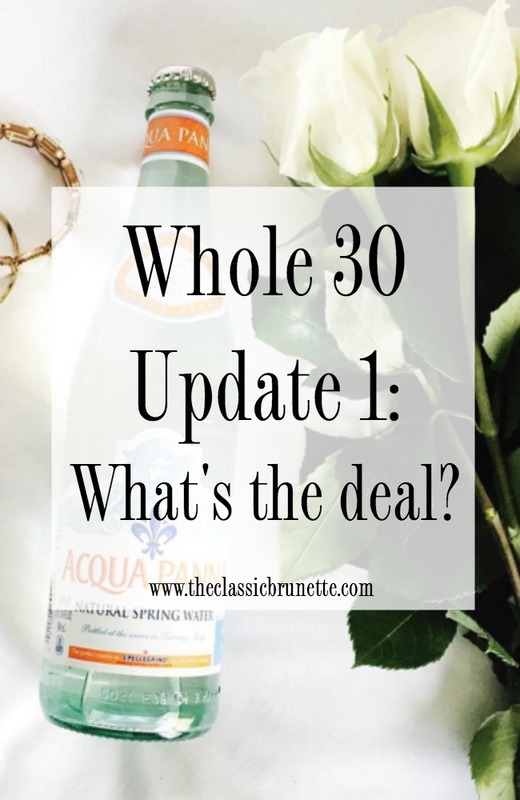 The Classic Brunette: Whole 30: What Is It And Why Am I Doing It? You go girl! I'm doing a 30 day yoga challenge and should do some health eating along with it! I loved reading your thoughts from the past few days. I feel like a lot of people doing whole 30 programs and other diets usually just talk it all up and rarely show the other side of things and how they're really feeling. I don't think I could ever do anything like this (I'm a crazy picky eater) but I am so proud of you for giving it a go! I'm also happy your roommate is doing it along with you. It's probably so much easier when you have someone there to encourage you along the way! Yeah I hate it when people don't give the whole truth about these things, everything, especially diets, aren't all sunshine and daisies! Also I'm actually a really picky eater too! It's not as bad as it may seem, yes I'm living off of the same few ingredients, but to be honest I feel like I do that anyway. It makes you get a little bit out of your comfort zone (I've tried a few things over the past couple days and it wasn't too horrific lol. Normally I don't try anything at all) but it's honestly not bad. For the most part I'm living off of some form of grilled chicken haha! Thanks for the encouragement, girl! I'm so curious about Whole 30. I may have to try it! I definitely liked reading your recap of the Whole 30 so far. I have a friend who has done the challenge and I'm curious about doing it too...it sure takes a lot of self discipline though! I have always wanted to try this. Maybe in the summer I will give it a go. I've done the Whole 30 and I LOVED it! No better way to feel healthier about yourself and help transition yourself into a happier, healthier lifestyle. YOU CAN DO IT! I've never done Whole 30, but I know it has so many great benefits for your body. I can totally relate to your body freaking out when it doesn't get all the same junk it had been. Just keep going! I can't wait to her how it ends up for you! This is so great!! This answers so many questions I had and am sure so many other people have too. Loving the break down of days haha.